Fr. Mike was born and raised in New Bedford, MA . He is the son of Barbara Racine and the late Donald Racine. He is one of 4 children. He attended New Bedford Public Schools and graduated in 1983 from the Greater New Bedford Regional Vocational Technical High School where he majored in Graphic Arts. His college education took him to Bristol Community College in Fall River where he received his Associates Degree in Liberal Arts in 1986. He continued his education at Southeastern Massachusetts University (now U-Mass Dartmouth ) where he received his Bachelors Degree in Sociology in 1990. Fr. Mike entered St. Mary's Seminary in Baltimore, MD in the the Fall of 1990 to begin his studies for the priesthood. In 1992, at the request of Bishop O'Malley, Fr. Mike transferred to Holy Apostles Seminary in Cromwell, CT where he received his Masters of Divinity in the Spring of 1995 . Fr. Mike was ordained a Transitional Deacon on January 7, 1995 at St. Mary's Cathedral by Bishop O'Malley and ordained a priest for the Diocese of Fall River on June 10, 1995 also at St. Mary's Cathedral by Bishop O'Malley. He celebrated his First Mass on Sunday June 11, 1995 at St. Lawrence Church in New Bedford. Fr. 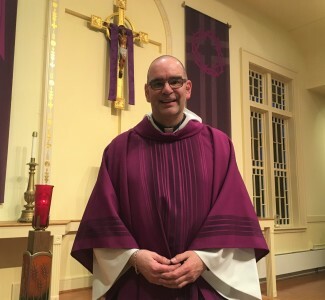 Mike's assignments have included 2 years as Parochial Vicar at Notre Dame Parish in Fall River, 6 years as Parochial Vicar at St. Mary's in South Dartmouth, 4 years as Hospital Chaplain at St. Luke's Hospital in New Bedford. In June of 2007, Fr. Mike was appointed as the 5th resident Pastor of St. Bernard Parish, Assonet, MA. Fr. Mike is also the Fall River Fire Dept Chaplain.